1. Make a “to do” list; do the thing you dread the most first so it’s off your mind. Set a timer. 2. Hire someone to do a good, deep clean once a year! OK that is for us lazy people! For me, I start at the top of a room, and work my way down. 3. Closet cleaning: donate items not sued with the last year; throw out old lotions or products and make room for new stuff. 4. Have too much kids artwork? Take a photo of each and make a photobook. Then you can throw away the artwork and not feel guilty. 5. Here are a few more tips from NTK contributor Lorraine Brock about how to store Kids artwork. 6. Take everything out of a closet. Everything. Then clean the closet, vacuum, etc. Then, try to put everything back. You will be amazed at the amount of stuff that you do not need, you are embarrassed that you still have, and that you willingly put in the goodwill pile. I do this with drawers too. Dump out the t-shirt drawer. Then, try to put stuff back. I realize that I don’t wear half of the t-shirts and give them away. 7. The issue with cleaning and spring cleaning is the overwhelm factor! When kids and even some adults look at things as a whole we tend to get discouraged and not succeed at the task at hand. So for my boys, we set aside a day or time slot and focus on one room or area together. We go through, making a trash pile, donation pile and a keep pile. After all things or items are sorted, we work to put away the piles in their appropriate areas. It can be time consuming when working this way if the area is large or it’s a lot to clean, but it helps with organization skills for my boys and makes the task not seem as big. 8. Lose something really important. My husband lost something really important so he systematically tore apart each room and organized it all. Now my house is spotless! 9. My children alike to help wipe down the baseboards. I give them a damp sock, and they make a “train” through the house! 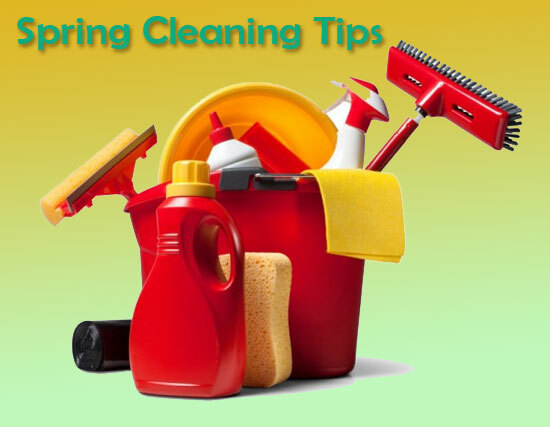 Have a spring cleaning tip you want to share with us? Leave a comment below!